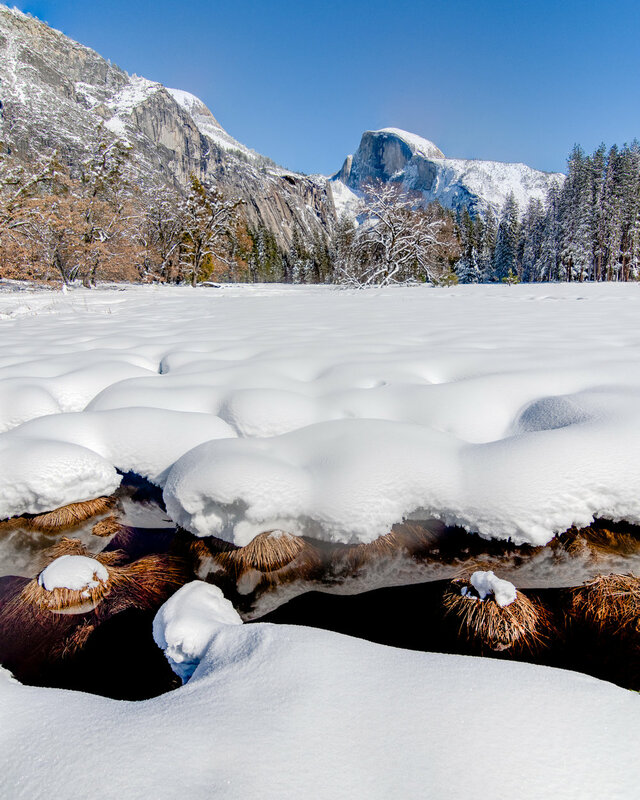 Snow makes Yosemite a magical place. On sunny days, the snow lightens up meadows. On snowy days, it gets a grey gritty feeling. It’s also much cheaper to stay in the winter time. Cedar Lodge in El Portal is my place to stay. It’s less than $100 per night during winter and it’s only 30 minutes away from the Arch Rock entrance to Yosemite. There is only one place closer and it’s quite a bit more expensive. I timed my visit to coincide with the natural “Firefall” event that occurs for two weeks in late February. See the caption in the Firefall photo. Here are my photos from this trip. Being in Yosemite while it’s snowing is less frequent than you think. My availability to travel has to match the weather forecast. The forecast can also change day to day from snowing to sunny. This time I happened to get to the Valley at the perfect time. It was snowing but not very cold. Normally, this tree isn’t even noticeable because it blends in with the background. This day, the snow in the air made this tree pop out from the background. I like it because of the scale of the tree from the larger trees and the granite cliff. The depth shows it isolation in the middle of the meadow. This beautiful stand of aspens in Ahwahnee Meadow cries out to be photographed. I would pass by this during my numerous visits trying to find a good backdrop. This day turned out to be great. It was snowing which gave the cliff face a muted ghostly look and allowed the aspens to separate themselves from the background. This big tree is my favorite in Yosemite. Its broadness and many branches says to me that it is proud to be a tree. Standing next to his skinny neighbor accentuates it. If you can tell, it was snowing which gives this image extra grit. I had to take this image from inside my car. The sun was right above the falls and was illuminating the trees. But, it was causing haziness and flare on my lens. I took it from my car so the roof would block out the sun. Sentinel Meadow usually is trampled by visitors. This little creek usually isn't there, but it created a moat and kept the clearing free of footsteps. Horsetail Falls is a seasonal waterfall on El Capitan. There has to be enough snowfall so that it flows which doesn't happen every year. When it's flowing, for two weeks in February, the sun during sunset lights up Horsetail Falls and gives it ths glow.